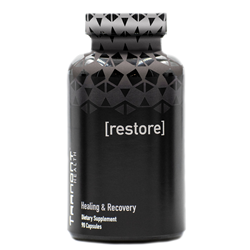 “[Restore] is a powerful proteolytic, vegetarian enzyme supplement. When athletes use [Restore], they’ll notice an improvement in recovery time, helping them get back to peak performance,” said Craig Kotter, Executive VP of Sales. Tranont launched a new sport nutrition product on Friday: [Restore] Healing & Recovery, a proteolytic enzyme blend to aid with workout recovery and faster healing from injuries. [Restore] Healing & Recovery uses proteolytic enzymes to help break down and remove waste surrounding an injury, resolving the inflammation phase sooner, which allows the body to heal faster. Formulated with a powerful blend of antioxidants, chelated minerals, and digestive support, [Restore] goes further than other supplements, potentially providing athletes and active people with additional protection against illness. [Restore] Healing & Recovery is the fourth vegetarian and vegan-friendly supplement in the Tranont Health supplement line, along with [Life] Enzyme Blend to Unlock True Health; [Balance] Multimineral, Vitamins & Antioxidants; and [Vibe] True Energy & Clarity nootropic supplement. Founded in 2013 by CEO Lorne Berry, Tranont is on a mission to impact one billion lives for good. Through personalized health and wealth education, we provide instruction, products, and services to help families reach their goals. Using a direct sales model, neighbors are helping neighbors improve their health, create more wealth, and leave a lasting impact in their communities. For more information, visit: http://www.tranont.com and http://www.thisistranont.com.